What a gorgeous card with a powerful message. Happy Saturday, folks! I am Medicine Horse, bringing you the message of freedom, journey, and progress. Do not act as though you are a beast of burden. Claim your innate divine dignity. Allow yourself to feel and be graceful. Recognize and honor your need for rest, openness, safety, and respect. An ability to hear, know, and feel spiritual truth, which will guide you in every aspect of your life journey, is opening up. Connect with your spirit. Live your truth. Meaning: There is a powerful and sacred bond between your soul and the animal kingdom. If you have a beloved animal who has left this world for the spirit world, here is a message that this beautiful being is protected by Great Spirit and ill loved and peaceful now. That creature is completely forgiven and completely forgiving. You are also guided to honor the inner knowing that flows naturally from your instincts and intuition. As you respect your inner guiding widsom, your life experience will improve. You will successfully navigate your way around negativity. healing, spirit communication, and loving repair of the sense of self after any type of abuse is indicated. There is spiritual support and assistance for a journey ahead that will take you far. Progress is being made. Spiritual Guidance: Medicine Horse bring healing gifts for the mind, body, and soul. Horse is healer. This oracle indicates that a time of significant healing is at hand. Sometimes the most powerful healing at soul level happens subtly. It may involve emotional catharsis and dramatic psychological “aha!” moments, but it often happens almost invisibly, without us realizing how much our inner work is reshaping us from within. Eventually, we experience the fruits of our inner journey. Our interpretation of past experiences changes, empowering us to leave behind old points of view, former identities, and negative expectations for the future. We begin to feel the lightness and promise of our spirit. We discover and delight in our own divine beauty. We have made progress and a new horizon opens up. Horse medicine also brings a special type of healing through two particular equine traits: authentic connection and heightened sensitivity. Many types of emotional damage to human beings can be healed through the experience of these two principles of Horse wisdom. It is the task of a spiritually aware and skillful counsellor—be that human or a horse— to mirror back one’s emotional experience with authenticity, presence, honesty, and acceptance in a way that build a sense of real connection to another living being. Horse medicine is the soul medicine of trust—trust in oneself, trust in relationship, trust in our bodies, intuitions, instincts and in life itself. To guide us and provide us with what we need. 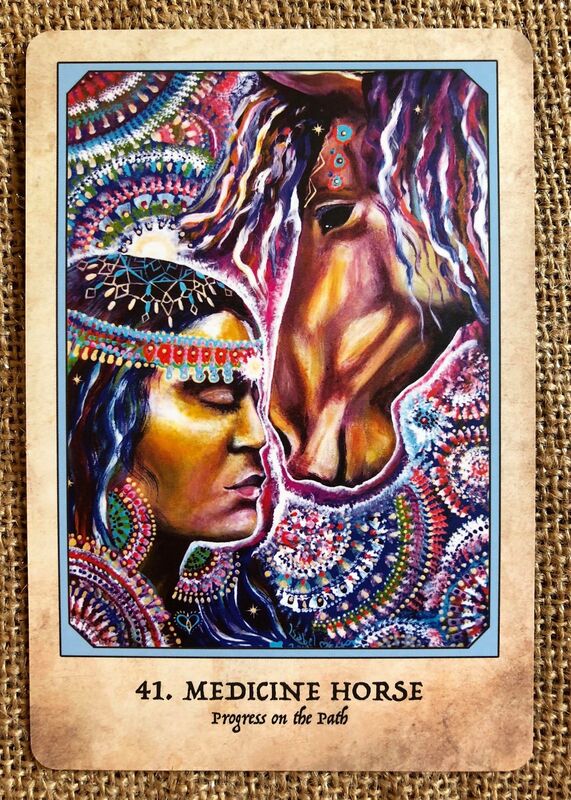 When Medicine Horse comes to you, there is a deepening in your aliveness, a release of automatic reactivity and defensiveness, and an ability to be increasingly alive, authentic, and real. You will believe more and more that the Universe has your back and has blessed you with the resources that you need not only to survive but also to thrive. You will also understand that you do not need to take this journey alone. Horse doesn’t want to be held back in any way, and its appearance is a sign of progress being made in our physical, worldly pursuits—and especially in the inner process of soul healing. Horse medicine is helpful for cultivating a loving and respectful relationship with the body, rather than trying to dominate it with mind. It can help us in undoing patterns of abuse and learning to trust in bodily instincts and wisdom. It is also especially helpful medicine for developing a constructive attitude toward fear. Horse helps us acknowledge all our emotions, including fear, and contain them so that we feel heard, without censorship, yet also safe and held. We can then channel the vital energy of our emotions into conscious choices that allow for progress, vitality, and engagement with the world.